A sequence of 11 frames, stacked here and colorized, show the Pinwheel system created by the binary star system known as Wolf-Rayet 104 seen by the Keck telescope in near-infrared. The fiery pinwheel in space in question has at its heart a pair of hot, luminous stars locked in orbit with each other. As they circle one another, plumes of streaming gas driven from the surfaces of the stars collide in the intervening space, eventually becoming entangled and twisted into a whirling spiral by the orbits of the stars. "Wolf-Rayet stars are regarded by astronomers as ticking bombs," Tuthill explained. The 'fuse' for this star "is now very short — to an astronomer — and it may explode any time within the next few hundred thousand years." Since the initial blast would travel at the speed of light, there would be no warning of its arrival. Gamma ray bursts are the most powerful explosions known in the universe. They can loose as much energy as our sun during its entire 10 billion year lifetime in anywhere from milliseconds to a minute or more. The spooky thing about this pinwheel is that it appears to be a nearly perfect spiral to us, according to new images taken with the Keck Telescope in Hawaii. "It could only appear like that if we are looking nearly exactly down on the axis of the binary system," Tuthill said. The findings are detailed in the March 1 issue of Astrophysical Journal. "This is the first object that we know of that might release a gamma ray burst at us," said astrophysicist Adrian Melott at the University of Kansas in Lawrence, who did not participate in this study. "And it's close enough to do some damage." 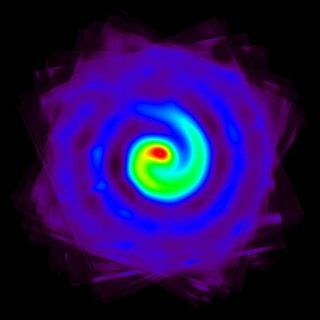 This pinwheel is about 8,000 light years away, roughly a quarter of the way to the center of the Milky Way Galaxy. While this might seem far, "earlier research has suggested that a gamma ray burst — if we are unfortunate enough to be caught in the beam — could be harmful to life on Earth out to these distances," Tuthill said. Although the pinwheel can't blast Earth apart like the Death Star from Star Wars — at least not from 8,000 light years away — it could still cause mass extinction or possibly even threaten life as we know it on our planet. Gamma rays would not penetrate Earth's atmosphere well to burn the ground, but they would chemically damage the stratosphere. Melott estimates that if WR 104 were to hit us with a burst 10 seconds or so long, its gamma rays could deplete about 25 percent of the world's ozone layer, which protects us from damaging ultraviolet rays. In comparison, the recent human-caused thinning of the ozone layer, creating "holes" over the polar regions, have only been depletions of about 3 to 4 percent, he explained. "So that would be very bad," Melott told SPACE.com. "You'd see extinctions. You might see food chain collapses in the oceans, might see agricultural crises with starvation." Gamma ray bursts would also trigger smog formation that could blot out sunlight and rain down acid. However, at 8,000 light-years away, "there's probably not a large enough effect there for much of a darkening effect," Melott estimated. "It'd probably cut off 1 or 2 percent of total sunlight. It might cool the climate somewhat, but it wouldn't be a catastrophic ice age kind of thing." One unknown about gamma ray bursts is how many particles they spew as cosmic rays. "Normally the gamma ray bursts we see are so far away that magnetic fields out in the universe deflect any cosmic rays we might observe from them, but if a gamma ray burst was pretty close, any high-energy particles would blast right through the galaxy's magnetic field and hit us," Melott said. "Their energies would be so high, they would arrive at almost the same time as the light burst." "The side of the Earth facing the gamma ray burst would experience something like getting irradiated by a not-too-distant nuclear explosion, and organisms on that side might see radiation sickness. And the cosmic rays would make the atmospheric effects of a gamma ray burst worse," Melott added. "But we just don't know how many cosmic rays gamma ray bursts emit, so that's a danger that's not really understood." It remains uncertain just how wide the beams of energy that gamma ray bursts release are. However, any cone of devastation from the pinwheel would likely be several hundred square light-years wide by the time it reached Earth, Melott estimated. Tuthill told SPACE.com "it would be pretty much impossible to for anyone to get far enough to be out of the beam in a spaceship if it really is coming our way." Still, Tuthill noted this pinwheel might not be the death of us. "There are still plenty of uncertainties — the beam could pass harmlessly to the side if we are not exactly on the axis, and nobody is even sure if stars like WR 104 are capable of producing a fully-fledged gamma-ray burst in the first place," he explained. Future research should focus on whether WR 104 really is pointed at Earth and on better understanding how supernovae produce gamma ray bursts. Melott and others have speculated that gamma ray bursts might have caused mass extinctions on Earth. But when it comes to whether this pinwheel might pose a danger to us, "I would worry a lot more about global warming," Melott said.